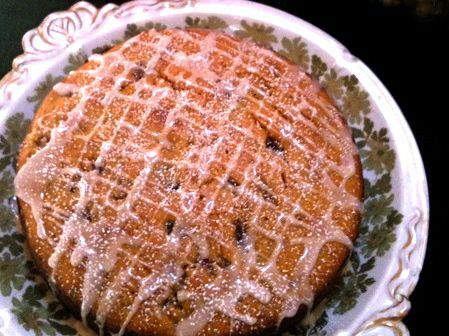 This large, moist cake is studded with dates and sweetened with maple syrup. You could coat it with a cream-cheese icing, but this cold-weather cake is also good served with maple yogurt plus a drizzle of warm maple syrup. A confession: I once baked this in a pan that didn’t want to let the cake go. It’s a lot of cake, and I didn’t want to throw it out, so I pried it away from the pan as best I could, then used it to make a bread pudding. There was enough to freeze half and do it twice. I’m not sure this isn’t the ultimate use of this cake. I hope yours doesn’t stick, but if it does, you know what to do. Preheat the oven to 350 degrees. Generously butter and flour a 9-inch springform pan. Combine all the dry ingredients in a bowl and stir them together with a whisk to blend. Cream the butter on high speed with the sugar until light and fluffy. Lower the speed and slowly pour the syrup into the butter mixture, then add the vanilla. Add the eggs one at a time, beating until each one is well incorporated and scraping down the bowl between additions. When well blended, stir in the squash. With the mixer on low, add the flour mixture in ½-cup increments until all is incorporated. Remove the mixing bowl and, using a large rubber scraper, give the batter several turns, scraping along the sides and bottom of the bowl, to make sure all the flour has been incorporated. Finally, add the dates to the batter. Scrape the batter into the pan and even out the surface. Bake in the middle of the oven until firm and springy and a cake tester comes out clean, 1 hour to 1 hour and 10 minutes. When mostly cool, release the rim and carefully transfer the cake from the pan onto a cake plate. Serve slightly warm or at room temperature, plain, frosted with the cream-cheese icing, with ice cream or yogurt, and warm maple syrup.